Some 100 hippos have died from a mysterious disease in a national park in south-western Uganda in the past month, say wildlife experts. The Ugandan Wildlife Authority (UWA) said they were carrying out tests to establish the cause of death in Queen Elizabeth National Park. UWA head John Nagenda says he thinks it may be rinderpest brought into the park by cattle seeking pasture. 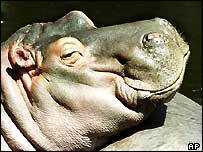 There are an estimated 4,000 hippos in the country. Twenty-five hippo deaths were reported the previous month. Mr Nagenda told AFP news agency said that an exercise to inoculate all cattle near the parks is going to be started immediately.